Week of October 5, 2018 | 1-2-3 SPORTS! What if the Steroid Era Wasn’t Really Caused by Steroid Use? So goes this convincing article from The Ringer’s Ben Lindbergh, who argues (1) the Steroid Era, and specifically the 1998 home run chase between Mark McGwire and Sammy Sosa, is over-credited with bringing fans back to baseball after the 1994 strike; (2) steroids are over-credited for the Steroid Era boom. Per-game attendance recovered much more in 1996 (+6.5 percent) and 1997 (+4.5 percent) than in 1998 (+2.9 percent). In 1999, with the memory of a thrilling record chase fresh in fans’ minds, it barely budged (+0.3 percent). Per-game attendance actually dropped (as did the economy, which might have more to do with attendance) in 2001, and again in 2002 and 2003. Not until 2006—well into the testing era—did MLB bounce all the way back to its 1994 attendance pace (which probably would have tailed off had the ’94 schedule been completed). Well, huh. Certainly, attendance isn’t the only measure of fan interest. But that is still pretty compelling, because fans show the most intense interest by spending their time and money going to games. So what other factors could have caused the offensive surge? The standard sabermetric line may have hewed to the scientific method, but reserving judgment and downplaying the link between PEDs and dingers was an impossible sell to most fans. Everyone who was watching baseball in the ’90s saw some sluggers get bigger; everyone saw some of those same sluggers post unprecedented stats; and everyone read the revelations about what they were ingesting (or injecting). The availability heuristic did the rest: Steroids were the most scandalous and memorable hallmark of the era, and thus they were held responsible for the sky-high home run rate. But recent events should reframe the narrative. In the past three seasons, MLB’s home run rate—expressed as the percentage of balls in play that turn into home runs—has dwarfed its previous peak, which it reached in 2000. Even with home runs on contact down slightly from last season, the 2018 home run rate is about 8 percent higher than it was at any point during the steroid era, and 20 percent higher than it was in 1998. Using camera- and radar-derived Statcast data that didn’t exist in all ballparks until 2015, researchers determined that the new balls were flying farther because of decreased drag, although they couldn’t establish with certainty which physical properties of the ball were reducing the drag. In other words, we know now that a subtle change in the ball is sufficient to explain an even more dramatic rise in home run rate than we witnessed in the ’90s. That doesn’t prove that steroids played no significant role in the previous spike, but it does demonstrate that steroids aren’t necessary to explain the earlier increase. It really could have been the ball. 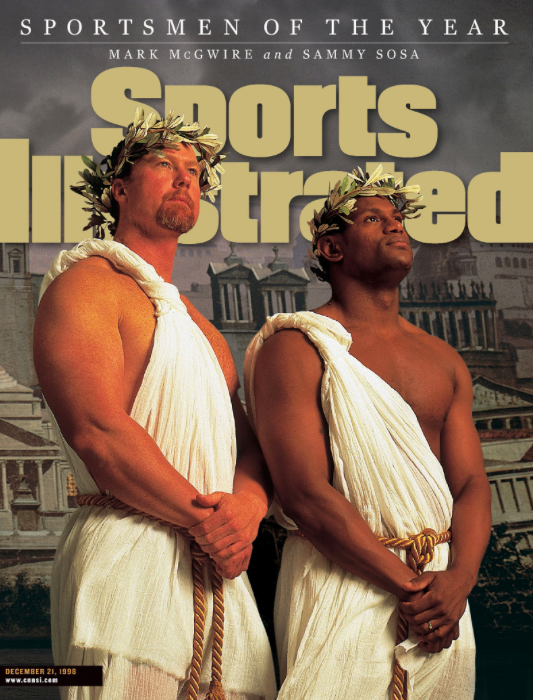 [A] steroid-related explanation for the sudden, dramatic increase in offense of the sort that occurred in ’93 and ’94 would have required a combination of extremely widespread, simultaneous PED adoption and drugs that were capable of producing a probably-implausible per-player improvement. “The crux, the evidence that seems blindingly obvious but which so many people just gloss over like a police inspector in a Sherlock Holmes story, is the suddenness of the change: a large step jump from one stable, self-consistent era to another such over a single season,” Walker says. 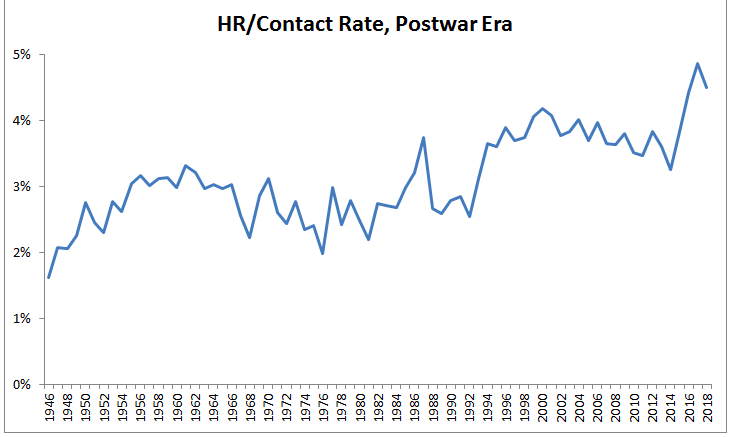 “There is no other possible explanation than a change in the baseball.” It’s certainly suggestive that the seasons with the largest year-over-year increases in home run rate on contact are, in order, 1977 (when MLB changed ball manufacturers, from Spalding to Rawlings); 1969 (when the mound was lowered and the strike zone shrunk); 2016 (the first full season with the reduced-drag ball); and 1993, followed by 2015 (the season in which the reduced-drag ball made its first appearance). However, Lindbergh does acknowledge steroids do appear to have contributed to older players remaining productive longer. Compared to the steroid era, today’s home runs are much more evenly distributed. 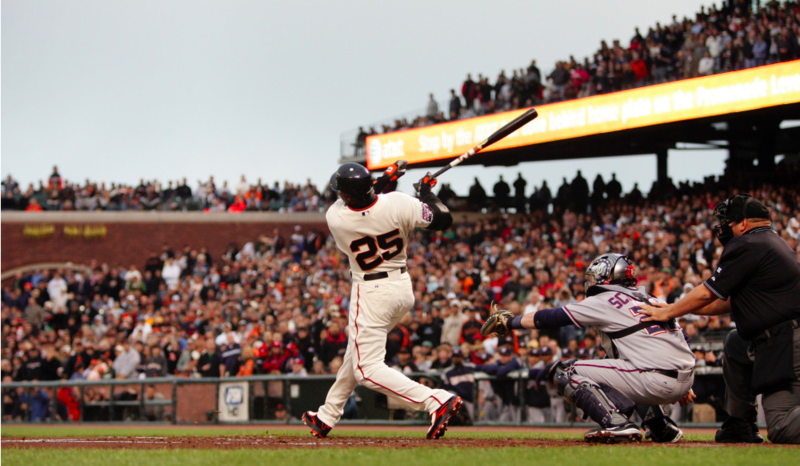 Everyone is hitting more homers, but elite home run hitters haven’t made the greatest gains. Instead, more and more hitters are putting up mid-tier totals, and no one is getting to 60, let alone 70 (or this year, perhaps, even 50). As Silver wrote in 2006, “There may have been a few players for whom steroids represent a ‘tipping point,’ allowing a relatively minor gain in muscle strength, bat speed, or recovery time to translate into a dramatically improved performance.” Regardless, it’s reductive and likely misleading to say that steroids saved baseball. And if we blame PEDs for retroactively ruining an era, we’re probably giving them too much credit for making it fun in the first place. We’ll never have the data to determine precisely how the ball behaved two decades ago, or who was taking what, when. We can say, though, that every other home run spike of the magnitude of the one that preceded the 1998 home run race was accompanied by a change in the ball or the mound and strike zone. Joe Mauer very likely played his last game as a Minnesota Twin this past week. For those of you who don’t know, Mauer is the living embodiment of the childhood dream: he grew up in St. Paul, he was a three-sport star in high school (Gatorade national football player of the year and a Florida State commit), he was drafted number one overall by his hometown Minnesota Twins, and actually lived up to the hype. 6x All-Star, 3x Gold Glove Winner, American League MVP, and – oh, by the way – the only catcher in MLB history to win 3 batting titles (and the only American League catcher ever to win a batting title). Add to all of this, he is by all accounts a model citizen. I know many of you will laugh at this, but Joe Mauer has more than a little in common with LeBron James (I KNOW, LeBron won a title). Number 7 will be retired in Minnesota, but ask anyone from from Minnesota and they’ll tell you that Mauer, and his $184MM contract has long been a contentious topic in my home state. In 2009, Mauer had one of the greatest offensive seasons ever by a catcher: .365, 28 HR, 30 doubles, .444 OBP, 96 RBI. Oh, and he also won a Gold Glove. At that point in time, Mauer was the biggest free agent available. A sure-fire Hall of Fame catcher in his mid-late twenties who had just won his third batting title. If Mauer goes to New York with the short porch in right or Fenway to bounce opposite field flies off the monster, god knows where his career ends up. 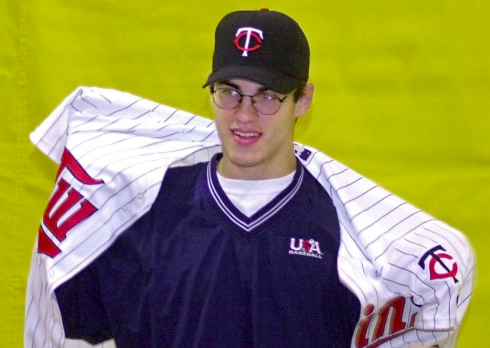 Instead, Mauer signed an eight year, $184MM contract with his hometown team. The Twins move into a new stadium with “Baby Jesus” leading all the disciples, and, as SI’s Gabriel Baumgaertner details, Mauer’s career returns to earth. He never hits more than 11 home runs again, and following a concussion in August 2013, Mauer is never the same hitter for average he was prior to that. 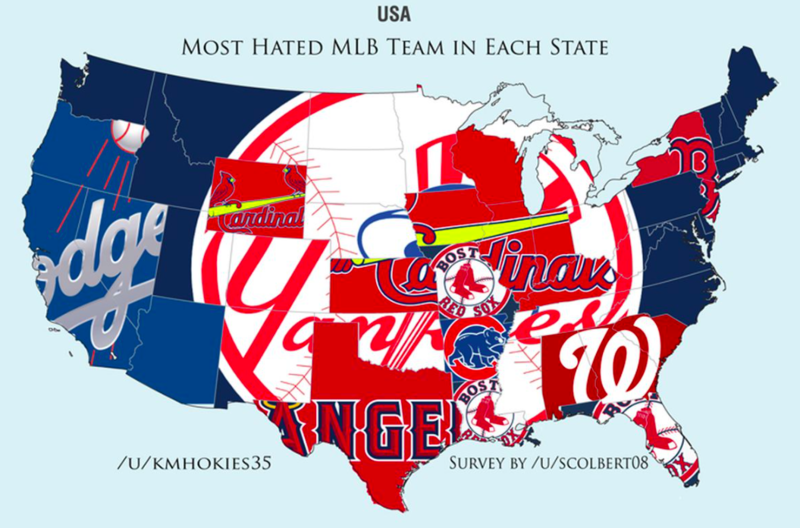 Half of the fans remains loyal to Baby Jesus (including my mom), while the other half felt like he was earning too much dough for the the team to be that bad, for him to get mysterious injuries (bilateral leg weakness), and for him to be a singles hitter. Mauer brings out the worst in us. “In Minnesota, we’re hardworking people and don’t like it if you’re being paid and you’re not out there performing,” says former baseball writer Andy Rennecke. Let’s pause to appreciate how stupid this cliche is. You know where else hardworking people live, Andy? Literally everywhere else! I think this is true of all sports and all fans in that they will very often side with the billionaires over the millionaires. In Minnesota every dollar is treated as not another player, perception that $23 million has kept them from signing others when the team has not filled their payroll base. The family that owns the Twins are multi-billionaires who own huge businesses around Minnesota. I don’t want them to go nuts, I just want them to spend 51% of their revenue. They don’t do that. Mauer is an unequivocal success – a story too perfect for even the movies. And yet, he made it hard to fully embrace him as our hero. You gotta win something. You gotta at least make a run, and the Twins simply didn’t, even when Mauer was at his best. The Twins went an astonishing 0-10 in playoff games over Mauer’s tenure (he wasn’t on the 2004 playoff roster), and Mauer had a single playoff RBI. TOB: Yeesh. 0-10!? I had no idea. I’d love to give Joe Mauer some truth serum and ask him if he regrets re-signing with the Twins. As you note, he would have hit a lot of dingers in New York, and they wanted him. I’m sure he felt a lot of pressure to stay. And maybe he would have felt more pressure in NY. But it’s kind of a Sliding Doors moment; or like Jim Belushi’s character in Mr. Destiny: how is Mauer’s life different if he leaves the Twins in 2009? How is baseball history different? How is Phil’s life different? How is my life different? Consider. The following season, the Yankees lost the ALCS in six games to the Rangers. In that series, Yankees’ catcher Jorge Posada, at the tail end of his career, went 5 for 19 with no homers and 1 RBI. What if that’s peak Mauer instead? Does the series change? Do the Giants beat the Yankees? Who knows. So, thanks Joe, for being loyal to your hometown. On a tangent, I went to check out the list of Gatorade National Players of the Year for football. It’s a fascinating list, filled with not just NFL busts but college busts. Over the last fifteen years, guys like Tate Martell, Jacob Eason, Justin Worley, Andrew Brown, Max Browne, Garrett Gilbert, Mitch Mustain, Kyle Wright, Brock Berlin, Chris Lewis, Jeff Byers. All were or are barely passable as college starters. Some never even started consistently, if at all. Some are absolute no names. Some ring vague bells in my brain, and I follow college football. Some were complete busts. Maybe they need someone new in charge of selecting the winner for that award (the guys in the 80s and 90s was killing it: Jeff George, Emmitt Smith, Robert Smith, Peyton Manning, for example). This says nothing of my opinion of Mauer, just something I found interesting. This week saw the beginning of the trial of agent Christian Dawkins, Adidas executive James Gatto, and former Adidas operative Merl Code. The three are accused of committing felony wire fraud as part of the FBI’s larger investigation into corruption in basketball recruiting. On Thursday, Brian Bowen Sr. testified. You may recall us writing about Brian Bowen, Jr. about a year ago when he was ruled ineligible after reportedly receiving $100,000 to commit to play basketball at Louisville. The numbers are illuminating. They’re impressive if imagined as a layer of banded stacks of crisp bills inside a briefcase, but in exchange for a year of work from a highly skilled and widely recruited worker whose services will soon be worth tens of millions of dollars in guaranteed money, they’re not much! Bowen Sr. told the jury that he received $2,000 per month from Shane Heirman for Bowen II to attend La Lumiere School in LaPorte, Indiana. Heirman was the head coach of La Lumiere at the time, and is now an assistant coach at DePaul. Bowen II began his high school career playing for Dawkins’ Dorian’s Pride AAU program, but moved to the Michigan Mustangs on the Adidas circuit after Adidas program director T.J. Gassnola offered Bowen Sr. $25,000 for his son to play for the Mustangs. AAU teams playing players is obvious. But high schools are paying for players, too? Yeah, I don’t know how you fix that one. PAL: I hate the idea of paying college players, but I don’t see another solution with the athletic companies so entwined in the sport. But does paying them in college stop the jockeying for position in high school and the AAU circuit? Do we let children sign shoe deals? If he decides to go to college, can he then be contractually obligated to only go to a school that has a deal with his shoe maker? At that point, to what degree would the shoe companies essentially running college programs? How much are they already running college programs right now? TOB: They already are. At least this would be out in the open. I think allowing players to sign endorsement deals is the easiest fix. In every other sport, this isn’t a problem: golf. skiing. tennis. They all sign sponsorships in order to afford equipment, travel, cost of living. It keeps the colleges out of it, solves a lot of the headaches colleges claim, and keeps things above board. And I knew exactly what to do. But in a much more real sense, I had no idea what to do.